Recycling, Exposed! A Breakdown on How And What Can Be Recycled. Recycling is a little more complicated than separating your cans, bottles, paper, and plastics. I know when I began my cleaning business, I had to take the time to understand what can and cannot be recycled, not to mention what happens to the recyclables after they’ve been turned in. You’d be surprised how many people ask me that. I consider the questions positive; people really are interested in a greener planet and the steps I am taking through my business to ensure that we have one. I’m going to break the information down for you as well. Let’s look at what can and cannot be recycled, and I’ll throw in some extra info to make you a recycling expert! Aluminum: Depending on the can, recyclable aluminum cans include your soda and beer cans, food cans, and even your wet pet food cans. The best rule of thumb is to see if the can is labeled as recyclable. If it is, you can toss it into the aluminum bin; just make sure to rinse it out first, as recycling plants need the cans clean. Glass: Nearly all glass bottles are recyclable, but here’s something you might not know: You need to keep the clear and colored glass bottles separate not just for the recycling plant but for you as well. Clear glass is more valuable, so you’ll receive a higher return if your recycling drop-off center gives you cash. Paper: Newspapers are the obvious recyclable product in this category, and you’re probably beginning to notice many of your cardboard products are marked recyclable as well. If they are, you can toss those in the paper bin provided they aren’t coated in a wax or plastic film and they aren’t contaminated by food. Check with your local recycling plant to see if magazines and catalogs are accepted in your area; sometimes, they’re not. Plastic: This is a biggie, not only because most everything is bottled in plastic these days but also because plastic does not biodegrade in landfills. If you must purchase that 24-pack of bottled water rather than using a filter, recycle the bottles instead of just throwing them away. If anything plastic has the recycling symbol on it, don’t toss it; recycle it after you’ve separated it by its code. What’s the code? Keep reading! 41 – ALU: This code identifies aluminum as the recyclable content in your cans. 70 – GL: This number stands for a mixed or multi-part glass container. 71 – GL: This number designates clear glass. 72 – GL: This is the number for green glass. 20 – PAP: Recyclable cardboard will bear this code. 21 – PAP: You’ll find this code on recyclable magazines, mail, catalogs, and other related paper products. 22 – PAP: A more general code used for plain paper. 01 – PET: This code stands for polyethylene terephthalate, which is the polyester fiber used in soda bottles. 02 – PET: High-density polyethylene is also used in plastic bottles as well as plastic trash cans, bags, and even fake wood products. 03 – PVC: PVC pipes are made of polyvinyl chloride. Other products include your “vinyl” flooring and window frames. 04 – PE-LD: Low-density polyethylene is also a material found in plastic bags, buckets, and plastic tubing. 05 – PP: This symbol stands for polypropylene, and you see it on your to-go coffee cups. 06 – PS: You know this one best as Styrofoam, and the chemical name is polystyrene. 07 – O: Everybody needs an “other” category, even recyclables! This could mean the container is made from any combination of the plastics listed here. ABS: This lettered code means acrylonitrile butadiene styrene, which is a fancy way of saying the hard plastics that make up your appliances, computers, and cell phones. Aluminum: Aluminum cans see a rebirth as other aluminum cans. 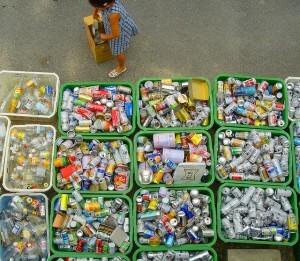 In fact, many of these cans are turned over and reused within six weeks. Glass: The same thing happens with most recycled glass; the bottles and jars are melted down and reborn into new bottles and jars. Paper: You’ve seen the labels on your paper products indicating the percentage of post-consumer recycled content the container contains; this is recycled paper. Plastic: Depending on the type of plastic, your water bottles might turn into the warm stuffing in your next ski jacket or that “wood” desk that isn’t wood. Aluminum Foil: Just like your cans, you can recycle aluminum foil. Batteries: You know not to throw them away, but did you know that all batteries can be recycled? CDs/DVDs/Video Game Disks: All of these can be refurbished and then resold to somebody else once you’re bored with them. Eye Glasses: The lenses and frames of that old pair of eyeglasses can be remade into a new pair for somebody else. Foam Packing: Don’t toss that annoying Styrofoam packing popcorn in the trash: Recycle it. Razors/Toothbrushes: If the plastic is recyclable, you can recycle these common toiletries instead of tossing them in the trash. As you can see, recycling does a lot of good, not only for the environment but for other people as well. Why throw away a pair of glasses that you aren’t wearing anymore when it can be made into a pair for someone else in need who can’t afford the purchase? Recycling or reusing benefits so many that you’d be foolish not to do it. Now that you understand the recyclables and their related codes, it’s quick and easy to separate and reuse things, especially if your city offers a weekly pickup. Check with your local waste management company to see what you can recycle, and then go green: You’ll be happy you did.